Brittany James graduated from Montclair State University with a BFA degree concentrated in oil painting in 2009 and has been a full-time artist and muralist ever since. As a Jersey Shore native, James began painting in Island Heights with mentor Elaine Sgambati and was inspired by the beauty of her surroundings. Nature has always been a big influence in her work . All of James’ paintings are derived from a combination of photo references and imagined scenes to create the surreal images she paints today. Most of her paintings are of surreal or fantasy-like subject matter, inspired by the relationships between women and nature, astronomy, astrology. James’ philosophy is that artists are seekers, always trying to understand the underlying, hidden truths. Nothing is exactly as it seems and reality is often hidden behind illusions. She has represented this theme in many of her paintings which are often inspired by dreams, memories, and life experiences. She is currently focused on the struggle some women face trying to find the delicate balance between wanting to be feminine and domestic, versus wild and free, and trying to be both at the same time. As a further emphasis on the relationship between reality and illusion, she uses a technique of dripping many layers of turpentine mixed with oil paint down the canvas before adding the images on top. This creates a break in the realism of the painting. In addition to painting, James teaches art classes for children and teens at Inspired Minds Fine Art School in Lincroft. 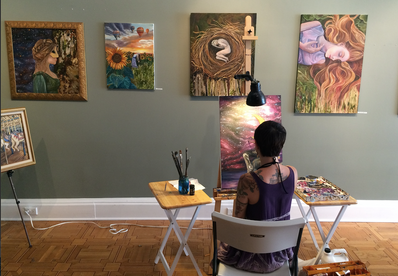 She also teaches painting classes for adults at art629 Gallery and runs an open studio for local artists. She is experienced in oil painting, acrylic murals, performance art, charcoal drawing, pastel, life drawing, printmaking, and sculpture. James has painted live on stage at the State Theater in New Brunswick and the Paramount Theater in Asbury Park during Glen Burtnik’s British Invasion shows, and was part of a performance art piece during the Summer of Love concert at Count Basie Theater in Red Bank. 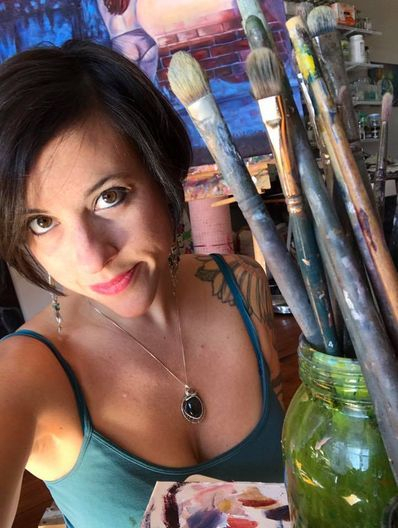 She has been a muralist and featured artist for the Asbury Underground Art & Music Crawl, and has shown her work in several New Jersey galleries including Torche Gallery and Belmar Arts Center in Belmar, Art629 Gallery in Asbury Park, and George Segal Gallery in Montclair. 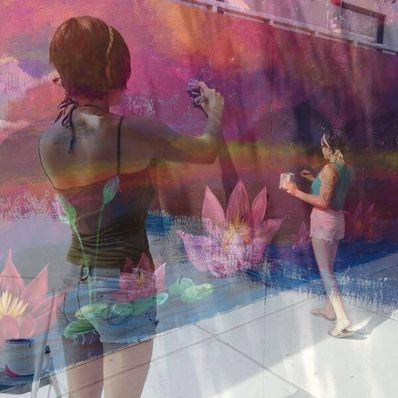 She was recently commissioned to paint a very large mural in Keansburg New Jersey, which can be seen on Main Street.